COMPETITORS STAND PROUDLY ON THEIR PEDESTALS HOLDING OVERSIZE PADDED JOUSTING LANCES. MANY EGOS HAVE BEEN DEFEATED IN THIS 17' x 17' INFLATABLE ARENA. 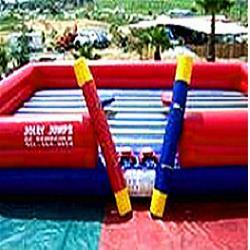 * Please call us with any questions about our jousting ring inflatabe rentals in Sedona, Cottonwood, Camp Verde, Prescott Valley, Chino Valley and surrounding metro areas.